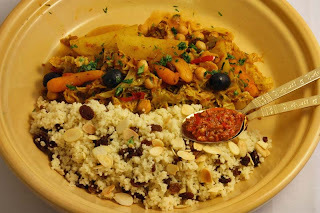 When people think of Moroccan tagines or tajines, they generally associate them to be made with Summer vegetables that echo of Mediterranean holidays or Autumnal vegetables, such as this one I made last year. However, this version includes a vegetable associated with cold wintery nights, the Savoy cabbage. I came across this vegan version of the Tagine recipe, whilst looking for inspiring ways to enjoy eating the seasonal Savoy cabbage. I know the green wrinkly Savoy cabbage in a tagine may not sound as appealing as golden nuggets of butternut squash, but trust me this really works. And please, please don’t be put off by the long list of ingredients, they do all compliment each other. Another thing, please don't think this recipe is not for you just because you don't have a tagine. Although a tagine would be good, it is not necessary. 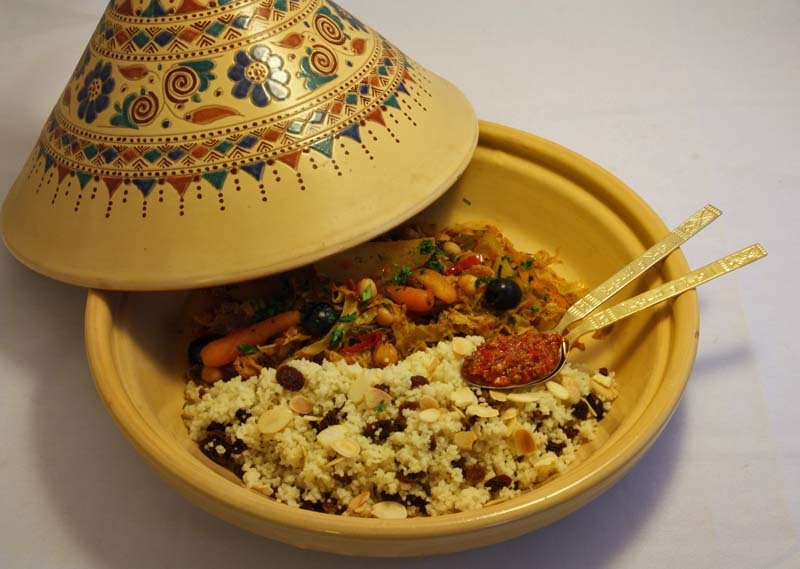 You can still make this at home tagine-style, I often do. 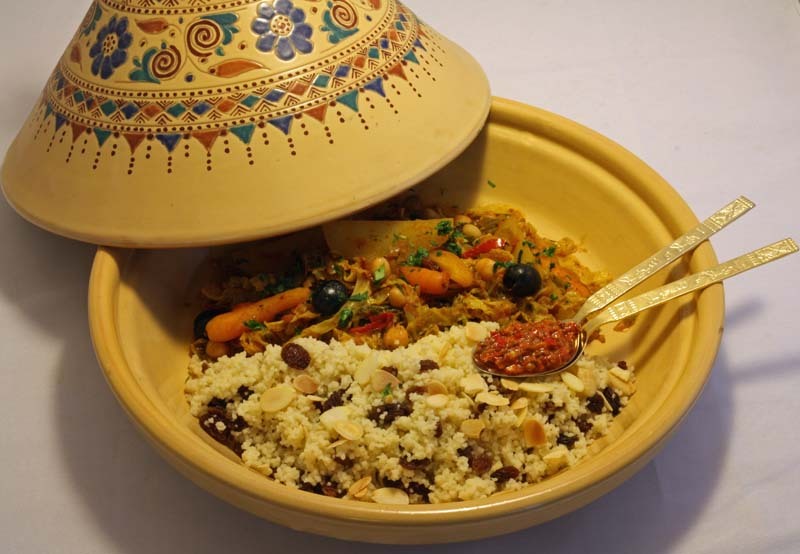 This tagine is neither too sweet or spicy, until of course you top it with harissa and then your tongue is transported for a few moments to another place, but taken with a spoonful of sweet delicate couscous the flavours are mellowed. This recipe comes from one of my well thumbed cookbooks New Food for Thought by Jane Noraika. Food for Thought is a vegetarian restaurant in Covent Garden that I have yet to frequent should I find myself in London again, but I have been fortunate to try out some of the recipes in the comfort of my home. The book does not have any photographs, this may hinder some people from picking it up, but not me. I like the ‘down to earth’ homely appeal of the recipes. What I also like about this particular book was it makes an occasion of the meal with recommended accompaniments, many of the other cookbooks I have at home fail to do this and you are left wondering what else to put on the plate so it is a proper meal. The creative people at Food for Thought restaurant have kindly granted me permission to reproduce the original recipe on my blog. I would like to Thank them, especially Vanessa Garrett for permitting me to share it with you all. Please enjoy making this recipe in your home too. Place the oil in a large saucepan with the onions, all the spices and the chilli. Cook gently until the onion is soft. Add the tinned tomatoes and tomato puree and cook for a further 10 minutes. Add the apricots, raisins, olives and potato wedges. Continue cooking until the potato is tender. Cook carrots in boiling salted water until tender. Drain. Heat a little oil in a large pan and stir fry the cabbage until it just starts to go limp. 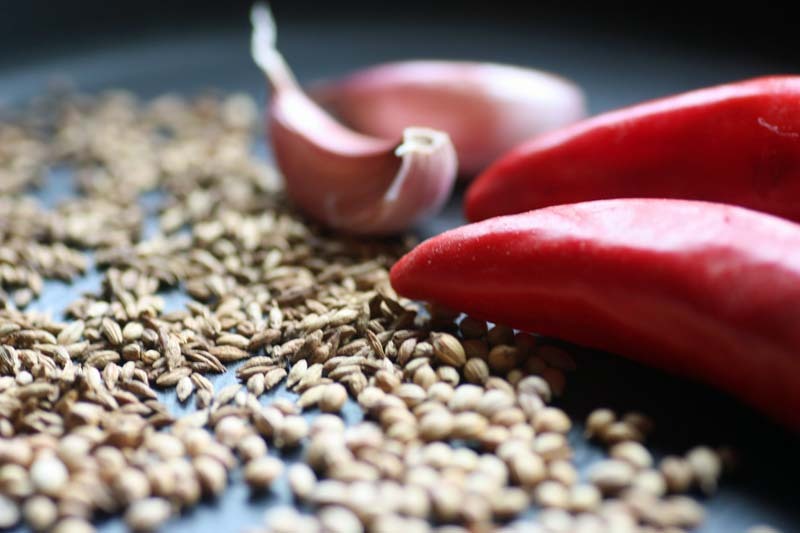 Place the whole chillies in a frying pan without any oil. On a gently heat, dry until the skin begins to blacken and blister. Remove from the heat, allow to cook, then de-seed. Wash your hands immediately afterwards. (I have to admit, because I was impatient, I just added the whole chilli, yes seeds included to the food processor). Transfer the harissa to a jar with a lid. It will keep for 2 – 3 weeks in the fridge. Serve with couscous and preserved lemons if you have some. Cover the sultanas with boiling water and leave to become plump. Drain. Add enough water to the couscous so that the grains are just moist. Place the almonds in a frying pan and dry fry until golden. Fluff up the couscous and gently stir in all the ingredients. Season to taste. The original recipe has some melted butter added to it, but I have to admit I omitted this as I thought there would be enough moisture and flavour from all the other components. That looks so good - and I love your tagine - so pretty! I picked my tagine from a charity shop about 6 years ago. It tends to sit pretty on the top of my bookshelf, so I was pleased to be able to feature it on my blog. It makes a good amount too. Should last you a few meals. Beautiful recipe! and beautiful tajine too! Do you use it often? MangoCheeks this is my kind of meal. I've just eaten supper but this has made me hungry all over again. I don't have a tagine or even a casserole, but I'm going to have to find some way of making it. Truth is I don't. It tends to sit pretty on my bookshelf. Just make it in a large pot, one that you can stir the veg in well and you should be set. It sounds delicious and I agree with the others, that is the prettiest tagine I have ever seen. Very jealous of that find. You can imagine my delight when I saw it all those years ago in the charity shop. Un-used too and all the way from Marrakesh, its handcrafted stamped on the base. I think its okay to serve in, but to cook in - I am a little cautious. Hey, thanks for stopping by my blog. Your recipe today looks great, especially to a newly turned vegan who is on the prowl for recipe inspiration. I'll definitely be taking a good nosey around! Thank you for visiting my blog, I really appreciate it when someone new comes on the scene. I have everything to make this tagine dish, with the exception of the cabbage...even have a rifi (unglazed clay) tagine that I love. Do you cook in yours as well as serve from it? I've read about tagines before, but I'm curious - how do they work? How are the results they produce different than, say, a pot? Wow...another wonderful thing to make in my dutch oven! yum! it seems to be heavily spiced, which i love. i also really like that place..very pretty picture. Oooh, what a fabulous looking dish! I have to admit, I've only ever made the summery tagines with butternut squash & dried apricots, but a wintery version sounds delicious! I'm also very intrigued by the harissa paste, I've nevr made or even tried harissa before. I've just harvested all the chillies in my polytunnel & was thinking of making some little jars of harissa with the chillies that haven't been strung up to dry or frozen. The weather here is cold & damp, so life needs spicing up a little! Looks so delicious. Do you think I need the special pan to make it? That looks like perfect (and beautiful!) comfort food! Thank you So, so much Alison. First for repaying the compliment and secondly for becoming a follower. Truly humbled. Thank you. The focus of my blog is primarily on seasonal vegetables, the recipes are always vegetarian, some of which will be suitable for fellow vegans, such as this one. So glad you like. Mimi - Thak you so much for repaying the compliment. It is a pleasur to have you visit. I don't often cook from this one, I'm a tad cautious with it. Would work well in a dutch oven! Although heavily spiced, the flavours do not come through that strong, except of course when you laden with harissa and boy it is hot (phew). Thank you so much littleblackfox. You can still make this in a wide,large pot or a casserole pot. Thank you so mcuh Lauren. I just did a morrocan style tajine! I will definitely be trying out this receipe soon though. Looks excellent and I love your tajine, very beautiful and unique. This tagine looks and sounds wonderful - I love the idea of cabbage in it (a vegetable that gets a bit overlooked) - I will definitely try this. Lovely to hear from you RuckusButt. The cabbage really does work. Please do give it a try. Generally I am too, but there are times when I find recipes in a book inspiring and go I am getting it anyway.